In 1858 New Plymouth was renamed Taranaki. Yellow and Black are the colours that are used in regional sports uniforms, particularly those of rugby. The two peaks shown are the main and secondary peak (Fantham's Peak) of Mount Taranaki (formerly Mount Egmont), the conical dormant volcano which dominates the landscape of the Taranaki Region (the nose-shaped bump on the North Island's west coast). Cheese production has long been the town's main industry. It has a population of about 2000. Very few small towns in NZ have their own flags. Manaia is located on the south coast of the "nose" of Taranaki, immediately south of the volcanic cone of Mount Taranaki/Egmont, in the central west of New Zealand's North Island. It is this volcanic peak which features prominently on the flag. Other than that, I cannot easily tell what the features of the flag represent, though the landscape of south Taranaki is dotted with numerous streams which radiate from the mountain - one of the two shown on the flag will very likely be the Kapuni Stream, one of the area's main watercourses and one with some local historical significance. The flag appears to be sponsored by (or at least includes the badge of) the local Lions Club. The white and brown figures at the base I can only assume relate to the town's Maori heritage, particularly in connection to the New Zealand land wars between Maori and European settlers in the late 19th century - they could easily represent the brown European military blockhouses and white palisades of a Maori pa, for instance. The area around the town was a major focus of fighting during this time (one of the main phases of the wars is known as the Taranaki War, and the village of Parihaka, some 30 kilometres to the northwest, is one of this country's most famous - or rather infamous - sites, and another location only some 10 kilometres from Manaia is the sight of the killing of leading settler military leader Major Gustavus von Tempsky. Manaia's nearest cities are New Plymouth, to its north, and Wanganui, to its southeast, and the large town of Hawera is located only about 10 kilometres east of Manaia. With a population of around 1500, it is located close to the centre of New Zealand's natural gas industry, which is focussed on south Taranaki, both onshore and offshore. The town's name is that of an early Maori chief who lived in the area, and is also that of a traditional mythological creature, a protective spirit often found in Maori carving. 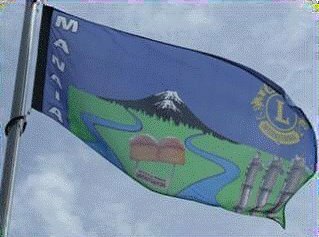 The flag was the result of a year-long project between the Manaia and District Lions Club and Yarrows the Bakers, It was designed by Paddy Robinson and raised 14 March 2001 on a pole outside Yarrows in the centre of the town. The flag was intended to create unity, instill civic pride and creative positive news for the town. Mr. Robinson described it as "an icon and taonga - a gift". A report of a raising ceremony held "in early April" in CenTar Regional Roundup, a newsletter for the Central Taranaki Region of the Anglican Church, says the flag features "Mt Taranaki, the Kaupokonui and Kapuni rivers, the loaf of bread and a cow." The mountain (black, capped white) is in the centre, the rivers to each side curving in symmetry through the green lower half of the flag. At the hoist the name "MANAIA" is inscribed vertically in white on a blue band, and in the upper fly is a yellow Lions Club badge on the blue background. The loaf of bread, below the mountain, between the rivers, is not a simple loaf of brad, but a depiction of the giant loaf of bread forming a welcome sign to the town. The inscription is not clear in the picture of the flag, but the real thing says "Welcome to MANAIA, // BREAD CAPITAL". (The bakery is the main business of the town, as well as a co-sponsor of the flag.) I don't see any sign of a cow, and I can't add any speculation on the white/black figures in the lower fly. Mr. Robinson himself performed the task of raising the flag most mornings, and one of the two flags produced from his design was buried with him on 29 August 2011.